These charts are for educational purposes only. Follow the trend... if stock is at 20 days high, trend is up and vice versa. Golden stoploss: min 10% or 20 days low (long position). Never risk more than 1% of your capital on any trade. Trend is down and will reverse on close above 8630 spot. The recent corrective rally has so failed to cross 61.8% retracement level. Now we have formation of swing low at 7960 and swing high at 8365 levels (all spot). Since markets are almost at halfway levels and considering that both support and resistance are nearby, it might make sense not to do anything unless you are a daytrader .... writing this from 4-5 days and so far nothing is happening - only broker earning. Option writing points to support at 8000 levels. This might mean limited downsides from current levels. The recent corrective rally has so failed to cross 61.8% retracement level. Now we have formation of swing low at 7960 and swing high at 8365 levels (all spot). Since markets are almost at halfway levels and considering that both support and resistance are nearby, it might make sense not to do anything unless you are a daytrader .... writing this from 3-4 days and so far nothing is happening - only broker earning. The recent corrective rally has so failed to cross 61.8% retracement level. Now we have formation of swing low at 7960 and swing high at 8365 levels (all spot). Since markets are almost at halfway levels and considering that both support and resistance are nearby, it might make sense not to do anything unless you are a daytrader. 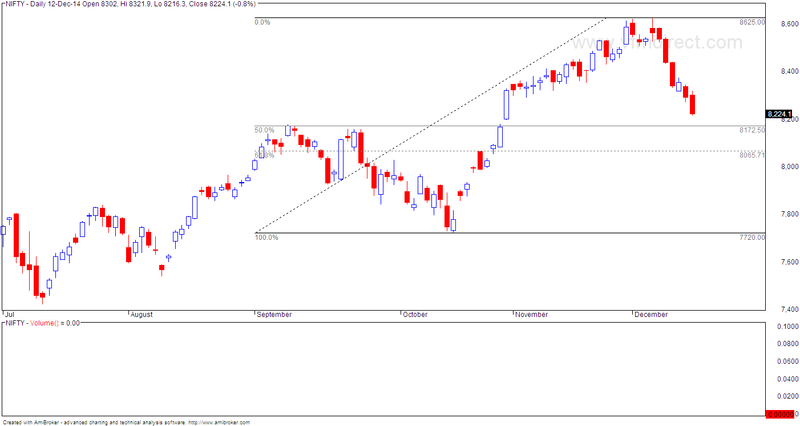 Rally fails to cross 61.8% retracement and terminates at 8365 levels. Now we have formation of swing low at 7960 and swing high at 8365 levels (all spot). Since markets are almost at halfway levels and considering that both support and resistance are nearby, it might make sense not to do anything unless you are a daytrader. This index has rallied the most and corrected the least. Decision levels for long / short - 19000 / 18400 spot. Within this downtrend we have a rally which may have fizzled out. This is now setting support (swing low) at 8000 and resistance (swing high) at 8400. Within this range, it makes sense to do nothing unless you are a daytrader. Option writing points to support at 8000 and resistance at 8400 (JAN series). Monthly charts: trend will turn down on close below 25000. Note that in USD, the trend is already down for quite some time but is not showing in INR because of currency fluctuations and customs/ duties etc. 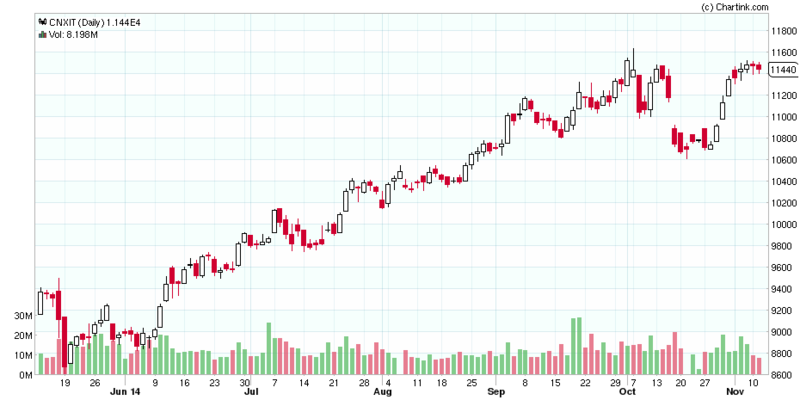 Within this downtrend, markets formed higher high higher low formation for 4 days. Today's close was however below yesterday's close and deep into previous day's candlestick body. Various possibilities exist at this stage... one is just a pause in this rally or possible formation of a lower swing high. In case of latter, it can mean a double bottom at 8000 levels (+/- 50 points) followed by a rally OR break of recent supports leading to new lows. These possibilities are shown on the charts. A loss of 20% in a stock does not mean that this can be recovered if the stock rallies 20%.. the stock must move by 25% then you are at breakeven. 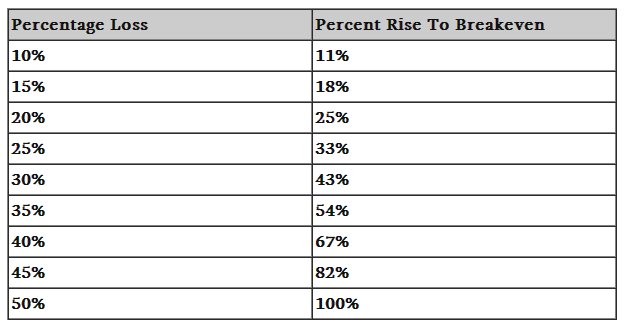 Similarly a 50% erosion in a stock requires a 100% gain for a breakeven. Within this trend which is down (on daily charts), we have bullishness on hourly charts. This will reverse on close below 8200. Note that markets close nicely in the positive, the advance decline has not been encouraging - it is roughly at 800-600. Something as simple as high school maths can have a dramatic impact on your trading. A trader's current views of probability could be completely wrong, and they could very well be why they are not making money in the markets. As we keep emphasizing, the Fed’s real concern is the bond bubble… NOT stocks. We get more evidence of this from Janet Yellen’s press conference after the Fed’s Wednesday FOMC meeting. During the conference, Yellen repeatedly stated that lower oil prices were “positive” for the US economy. This is simply astounding because the Fed has repeatedly told us time and again that it was IN-flation NOT DE-flation that was great for the economy. And yet, on Wednesday, the head of the Fed admitted, in public, that deflation can in fact be positive. How can deflation be both positive for the economy at the same time that the economy needs MORE inflation? The answer is easy… Yellen doesn’t care about the economy. She cares about the US’s massive debt load AKA the BOND BUBBLE. The US Federal Reserve has pulled the trigger. Emerging markets must now brace for their ordeal by fire. They have collectively borrowed $5.7 trillion in US dollars, a currency they cannot print and do not control. This hard-currency debt has tripled in a decade, split between $3.1 trillion in bank loans and $2.6 trillion in bonds. It is comparable in scale and ratio-terms to any of the biggest cross-border lending sprees of the past two centuries. This index looks the strongest amongst other indices. Trend is down and will on close above 12000. 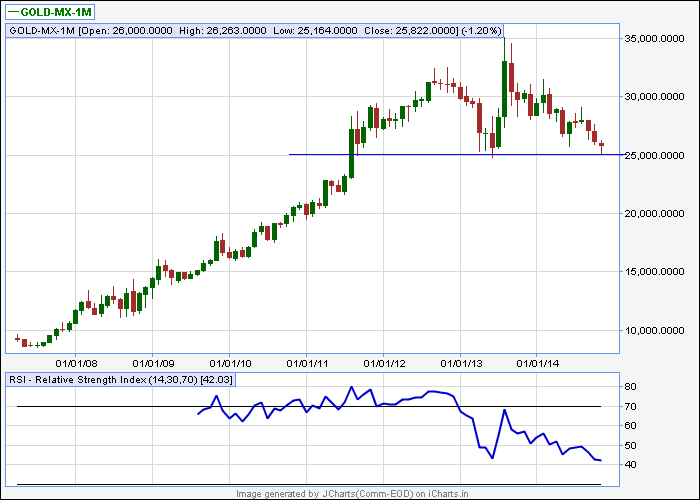 Currently the index is trading near double bottom support at 10700. Formation of lower swing high is expected. NIFTY trend is down and will reverse on close above 8630. Formation of lower swing high is expected. Within this downtrend, markets recovered smartly off oversold conditions... this was along expected lines. Now within any trend, an anti-trend move of 2-3 days is allowable. So now we have 2 days of higher high higher lows and also 2 gaps to contend with. Interestingly, today was a small bar implying selling at higher levels. Yesterday's hammer was the first clue and condition for trading above yesterday's high was met on open itself. Now within any trend, an anti-trend move of 2-3 days is allowable. Today was the first day so a rally for another day is perfectly fine. Today, markets formed a hammer... this has bullish implications if nifty can trade above today's high tomorrow. Markets remain oversold as of now but in strongly trending (down) markets, this is normal. Let us if we get a bounce from current levels. Within this downtrend, markets have broken and closed below the support at 8180... this has also had the effect of creating an oversold condition on RSI charts. The current close is almost at the 61.8% retracement level. Option writing points to support at 8000. Within this downtrend, markets have taken support at 8180... this is along expected lines so no surprises here. What is important from here on is how the markets will behave from here on. A small rally or time consuming rally will see formation of a lower swing high followed by new lows. Bullish contention will require a fast breakout above 8630 spot. Some stocks which have not corrected at all... I am long in all of them. My SL is 15-20 days low. Do not consider this as a recommendation to buy or sell. The reason of this post is to show that while markets are correcting, there are still a lot of stocks which are holding firm and doing well. They may correct later on or rally further but that is a different story. Unlike the nifty which has broken its recent swing low, BNF trend is still up. It is actually looking strong compared to the nifty. Expect more strength above 18600. Best indicator is no indicator..... I see pure price only... it tells everything you need to know. All other indicators only add noise as they are derivatives of prices or are indicators of indicators. But if you feel compelled to use one, then limit yourself to 1 indicator. More indicators just complicate and are unlikely to add value. Similarly the oil age will not end because of lack of oil. Past one year or more, everyone is expecting a rate cut from RBI so as to "boost" the economy. 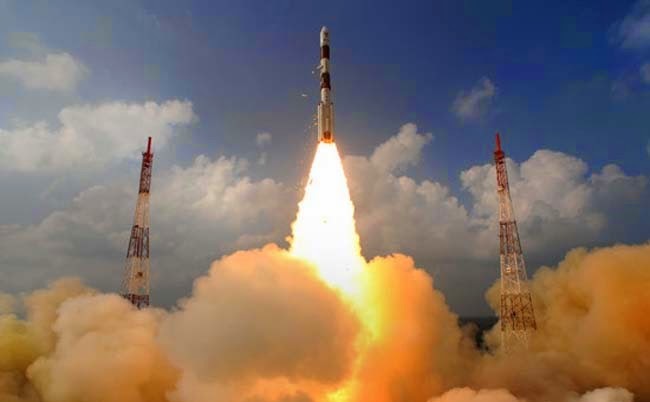 The NIFTY in this period have rallied from 6000 levels to 8000+ levels without any rate cut. So what will happen if the interest rate cut actually happens? Would an interest rate cut be considered a bullish indicator or a bearish one considering the fact that markets anyway blasted without a rate cut? This is the fibonacci retracement chart for nifty... 50% retracement is at 8170 levels which is also the previous peak formed in SEP.
Markets close 3.7% in the red this week. I thought this would be the biggest weekly drop this year but I was wrong - markets had closed 3.8% in red in one week in JUL 2014 (shown in circle in chart). That time, nothing happened thereafter and markets continued their rally. This time, I don't know if the same will happen - however we are very close to support at 8160 spot so let's see if market's bottom out here or not. 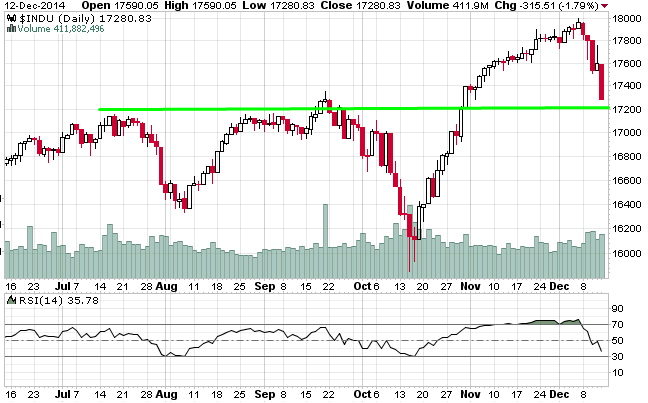 Both DOW and S&P are close to supports... RSI also nearing supports. Expect good support at 27250... RSI also nearing supports. My trend reversal level for nifty was 8300 spot and today markets closed below this level. Now I have to assume trend is down till nifty closes above 8630 spot. I expect good support at 8160 spot levels. 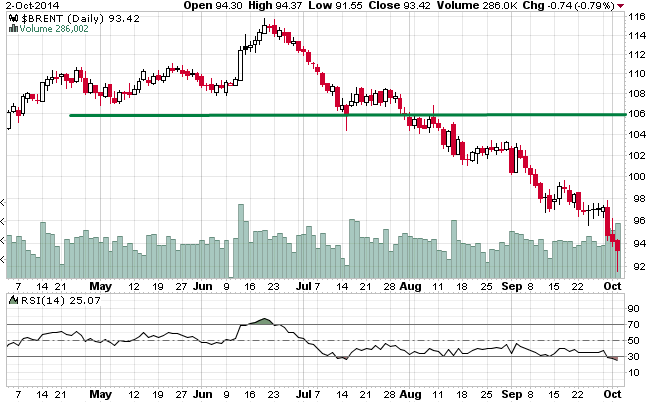 Note that hourly charts gave a sell on close below 8500 and this is the level a futures trader should be looking at. A word about 8300... there is nothing magical or sacrosanct about this level. Normally I take recent swing low as reversal level. In this case, the swing low was at 7700 and nothing above that till 8630. Since we need some SL I settled on 8300 as we had a cluster of supports here. So this 8300 is more of a support area and not a swing low level. Also, it does not matter in this case if the support is at 8280 or 8310. 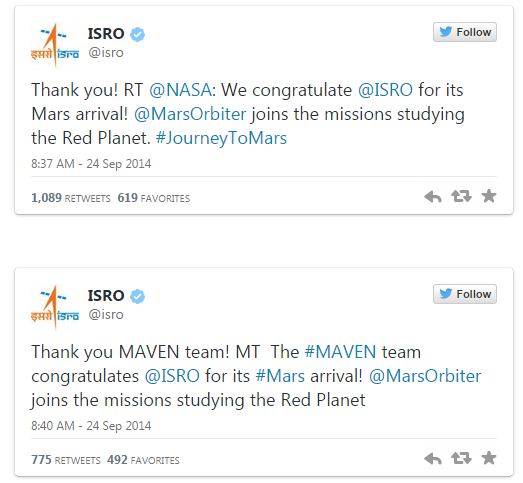 If the trend has to turn down, whatever level you plot (eg. 8200 or 8400) has to eventually break... it may happen few days earlier or later. Short term trend (hourly charts) is down ... EOD trend is still up and reverse on close below 8300 spot. My swing indicator SL is 8300 (20 days low). Those who like to focus on MA should note that 50DMA is 8210 spot.... this level is NOV month low. Option writing is giving mixed clues... writers expect 8300 to break but they are not expecting a big fall. They also do not expect markets to cross 8600 in immediate future. Faster retracement of rally hints at a bigger correction. While support at 8300 is not violated, the extent of fall in 2 days in comparison with the number of days required to rally means we are looking at a trend reversal. Note that hourly charts gave a sell yesterday and 15 min charts gave a sell from 1-DEC. Trend is up and will reverse on close below 8300. Current uptrend is weakening and the index has closed below the recent swing high / resistance at 11600. The index also suffered its largest one day fall in past 20-30 days. BNF still trending up nicely.... no signs of any weakness. 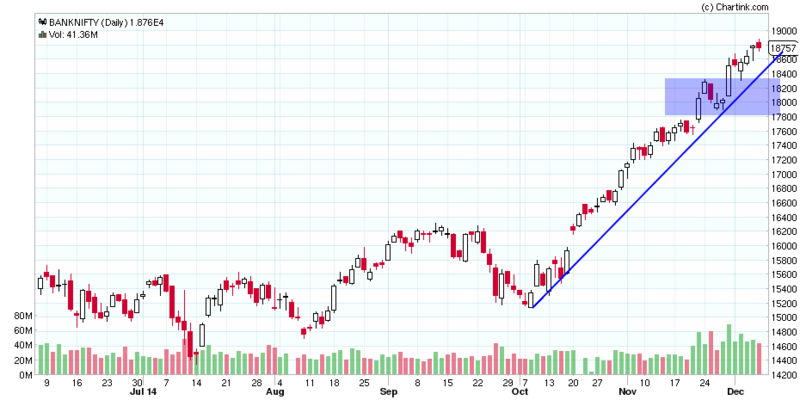 I am also looking at trendline support as shown on the chart. 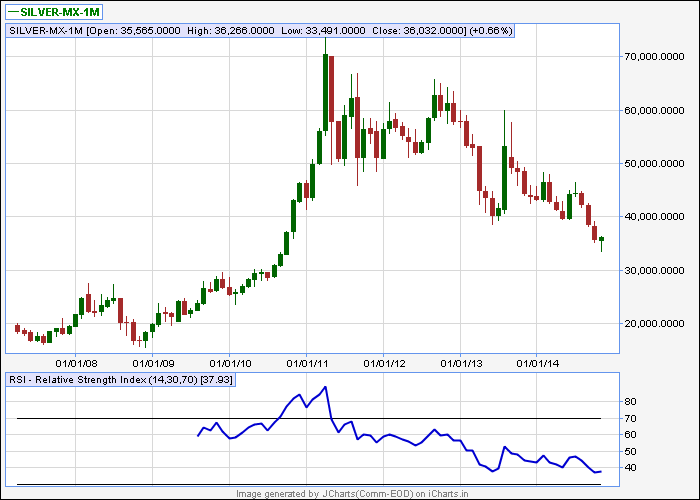 India VIX is almost at record lows... not a good sign as it indicates lack of any fear in markets. VOLTAMP breakout... note that this is a low volume stock but I like the chart as an example of how a breakout should look. 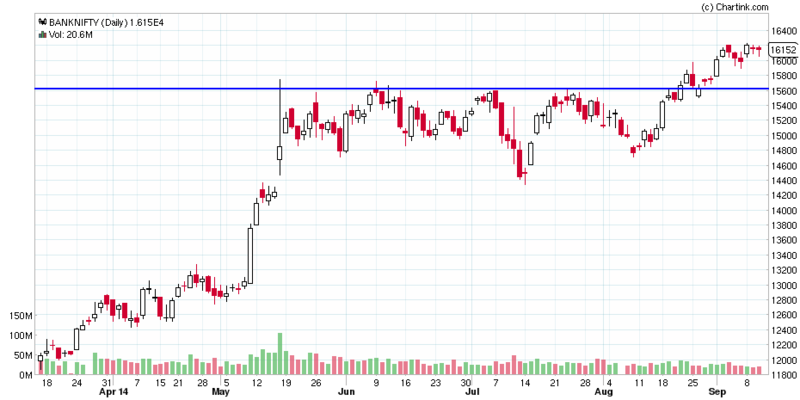 The breakout level is 740 and since this level offered resistance in the past, it should now offer support. Your SL will be below this level. NIFTY JUNIOR index has given another breakout... now this index (trending up) will reverse on close below 18200. Signs of increasing volatility in the region between 8500 and 8650 spot. Option writing shows increasing support at 8500 and diminishing resistance at 8700 levels... this is a bullish sign. Today markets traded in a range and failed to give any directional breakout. Ideally it should have crossed yesterday's highs but since it has not, one should start becoming cautious. Stock has given a strong breakout... the fundamental explanation is the rather substantial drop in crude prices which will substantially benefit an airline company as fuel accounts for large cost of its operations. See the breakout ... 40% gain in less than 2 weeks. 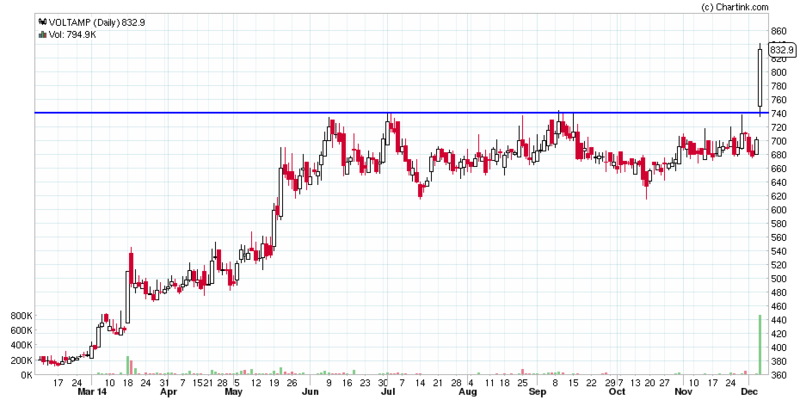 Breakout above 16200 is still strong with only a minor correction in between. Consider trend as up with swing low support at 17800. Today, markets closed in the red for the 2nd consecutive day. Within an uptrend, lower high lower low formation is allowable for 2-3 days after which prior trend must resume. The nature of the fall looks like a correction and not a trend reversal. For a trend reversal, I will look at a faster retracement of the previous rally and so far this is elluding us. Option writing is giving mixed clues... resistance at 8700 and support at 8500. This is a 2 year weekly chart... after giving a buy signal around 3400 levels. 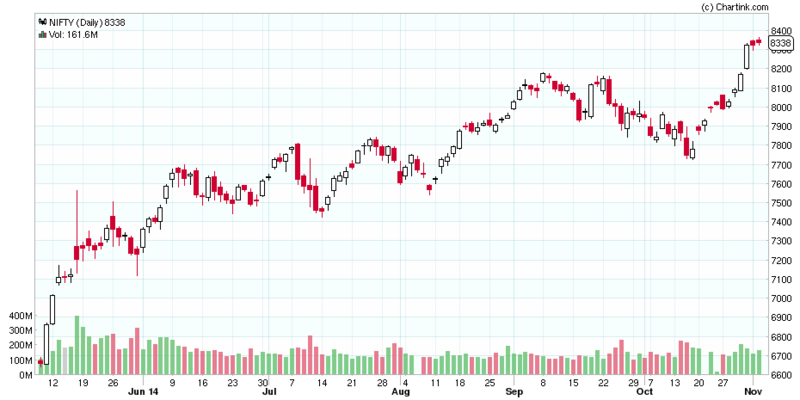 the index is now consolidating and trading in a range. Note that while is still making new highs, this index has not crossed JULY highs and is in fact correcting. Support 4800... further bullishness above 5400 levels. Option writing points to support at 8500 and resistance at 8700. This is as per yesterday's data. Let's see how markets behave at these levels. Markets give a fantastic weekly close ... trend remains up and will reverse on close below 8300. Note that markets have fully retraced the the fall of 25th NOV. I said in a previous post that "inability to ... close above 8535 can lead to start of a bigger correction. First confirmation will be break of 8400 spot". So markets have closed above 8535 and confirms trend is still up. Option writing (DEC) points to mixed clues. Support at 8500 and resistance at 8600-8700 levels... Difficult to arrive at a clear understanding where option writers see support and resistance this series. Market outlook - limited upside in DEC? Note that markets have closed in the positive for 2 consecutive days but have not retraced the fall of 25th NOV. Inability to do or close above 8535 can lead to start of a bigger correction. First confirmation will be break of 8400 spot. Option writing (DEC) points to resistance at 8500 levels... there is no clear indication of where put writing support is available. All this might mean limited upsides with possibility of a good correction. Today there was no further selling and low formed in yesterday's 20-30 min provided good support. Crossover above day's high was bullish and advance decline was positive throughout the day. Option writing points to resistance at 8500 (DEC series). Today was first day of decline.. within an uptrend a correction of 2-3 days is allowable. Recall that past few days advance decline was not supporting rallies... so today's fall is nothing surprising. Advance decline is not supporting rallies... this is something happening from past few days even as nifty is making new highs, stocks are breaking supports. Markets close at new high confirming that trend is still up with support at 8300. On a different note, advance declines is not supporting higher moves past few days... we are seeing a lot of selling in stocks even as markets continue to move up. This creates the justifiable feeling that while markets are going up, my stocks are not going up. In fact there are hardly any good buy calls in past 2-3 days. BANK NIFTY now @ 18000. Remember this post? BANK NIFTY now @ 18000. Remember this post made on 17th May 2014? Hold positions with a trailing SL. Let markets tell you when to exit. Trend is up with support at 8300. For a trend reversal, we need faster retracement of last rally. Swing low support is at 7700. Resistance is expected around 8450-8500. 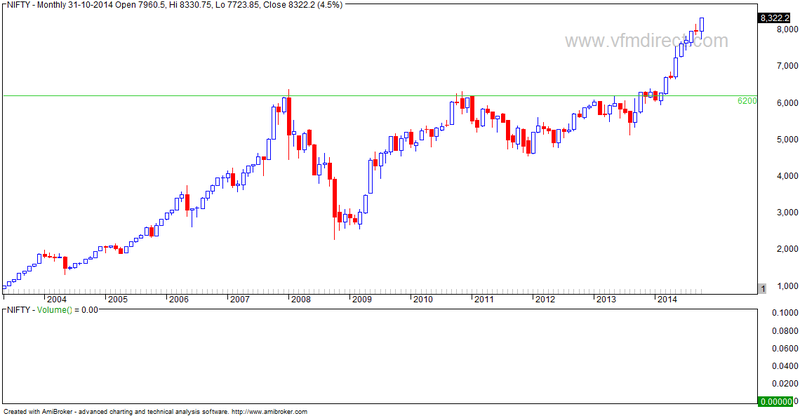 Sustaining above 8500 will have bullish implications with rally possible to 8900. Option writing points to support at 8300 and resistance at 8500. Trend is up with support at 8300. Swing low support is at 7700. Resistance is expected around 8450-8500. Sustaining above this will have bullish implications with rally possible to 8900. Resistance is expected around 8450-8500. Sustaining above this will have bullish implications with rally possible to 8900. Trend is up with support at 8300. Deep support exists at 7700. Recall that past 2 weeks markets were rangebound but found continued support at 8300 and not once did markets close below this level. 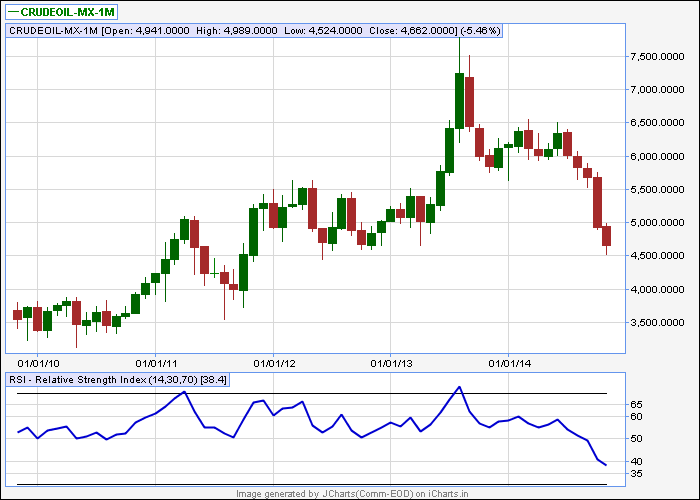 10 year monthly charts - crude broke support at 5500. Trend is down with support at 4500 and will reverse to buy on close above 6500. 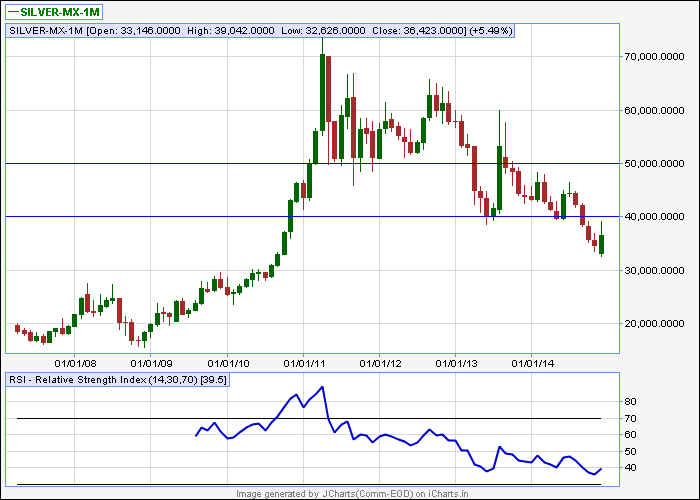 10 year monthly chart - Gold is testing support at 25000.. pullback possible from here. Long term trend of GOLD is down but there is possibility of a short term bottom being formed. 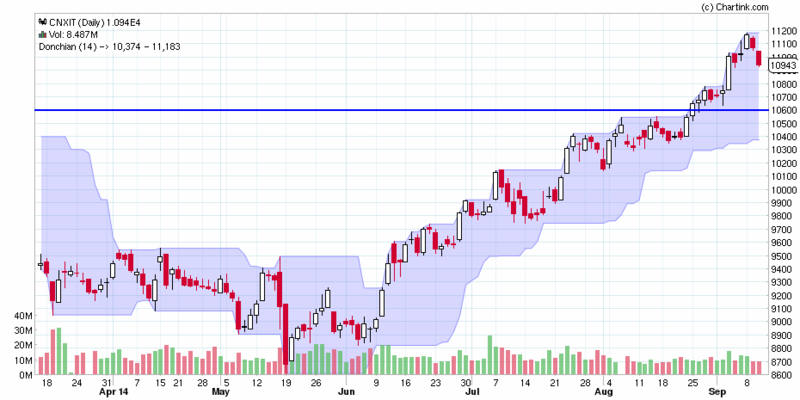 On daily charts, trend is up with support at 8300 spot. On weekly charts, trend is up with support at 7700 spot. Past few days action points to selling at higher levels and unwillingness of bulls to add more positions. This is also evidenced by multiple dojis. At a broader level, trend is up and will reverse on close below 7700. Any correction from here will likely form a higher swing low (ideally around 7800 or above). Immediate support 8290 spot... break below this lead to start of correction. Option writing points to resistance at 8500 (NOV series). Trend is up and will reverse on close below 7700. Any correction from here will likely form a higher swing low (ideally around 7800 or above). Option writing points to support at 8000 (NOV series). Break of recent swing low at 11000 led to trend reversal. Now buy above level is 11600. Any short trade in futures would have been stopped out when the index crossed 11000 in last week of OCT. Trend is up with support at 16000. Immediate support is at 17200 ... close below this can lead to start of correction. 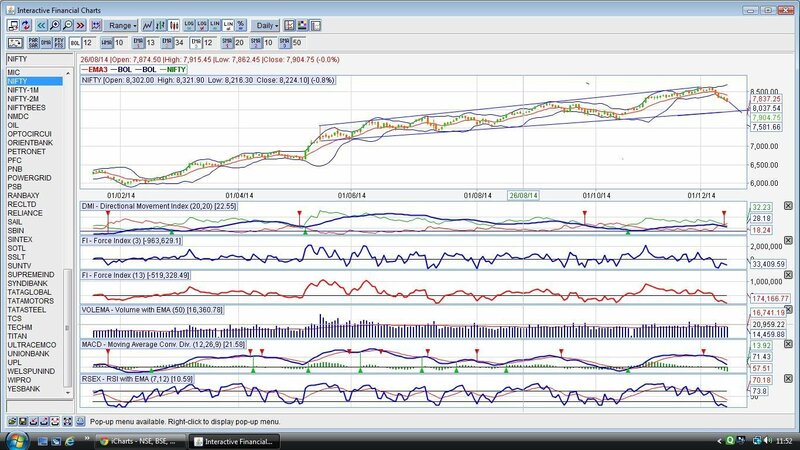 It is expected that this correction will lead to formation of a higher swing low (currently it is at 15000). I saw in your post that u have invested in GATI,GDL,Snowman Logistics.May I know how to invest in these kind of stocks which gives an unbelievable return.I have a basic knowledge of reading balance sheet,P&L acct and some basic technical analysis like Elliot wave..After knowing this,I think I can invest in other stocks rather than investing in Nifty 50?I am just 25 years old.Guide me to move to the next level. 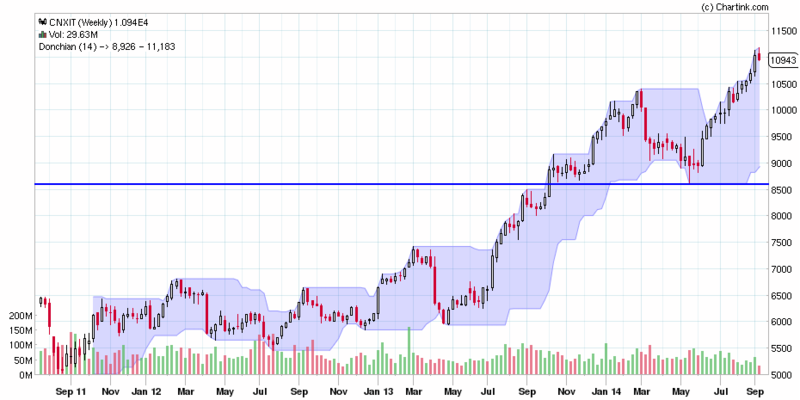 RANBAXY poised for multi year breakout... this will be a 10 year breakout. Breakout level is roughly 650-700 levels. Your stoploss 550-580. If we run a scan on CNX 500 stocks for finding out stocks which are trading at 20 day high, we get a long list. How to choose which stocks to invest in?? Candlesticks is a Japanese trading technique invented in the 18th century by rice traders. Today this technique is called candlestick charting and is widely used when drawing stock charts. If a betting game among a certain number of participants is played long enough, eventually one player will have all the money. 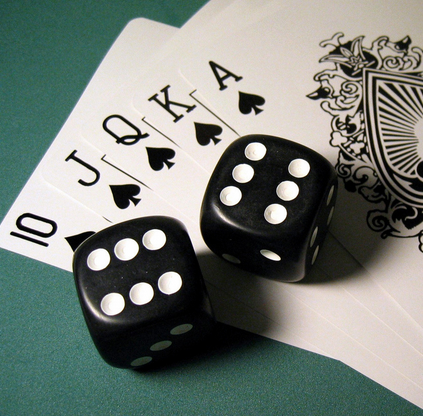 If there is any skill involved, it will accelerate the process of concentrating all the stakes in a few hands. Something like this happens in the stock market. There is a persistent overall tendency for equity to flow from the many to the few. In the long run, the majority loses. The implication for the trader is that to win you have to act like the minority. If you bring normal human habits and tendencies to trading, you will gravitate toward the majority and inevitably lose. On daily charts, trend is up and will reverse on close below 15600. Swing low is at 15000 levels. The month has ended and nifty trend remains strongly up. Unlike daily charts, there is no hint or indication of any correction so this still remains a buy on dip market. First sign of any trend reversal will be close below 7700. Note good support near 6200 levels... this level would be an excellent level to buy stocks whenever we have a correction. Trend is up on weekly charts. 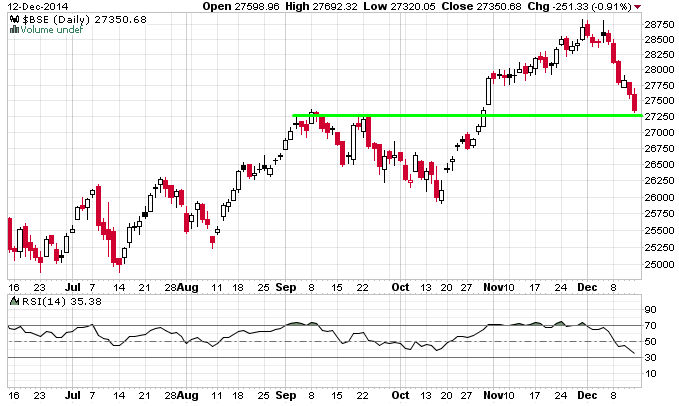 As markets close at new high, the swing low has now shifted up to 7700 levels (earlier it was 7420-7500 spot). Now trend reversal level is 7700. Trend is up and will reverse on close below 7800. 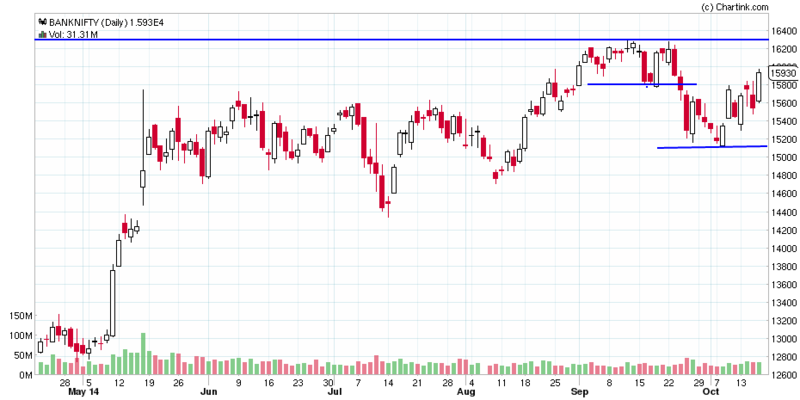 Above 8200, rally possible to 8500 spot. Trend is up and will reverse on close below 7800. Markets close above 8000 first time this month. So while technically the trend has shifted to "buy" on EOD charts, one has to consider the previous day's bar high at 8060 showing selling. Markets form "dark cloud cover"
Markets form a "dark cloud cover" or "piercing bar pattern". This happens when we have a nice gapup opening followed by a selloff which closes within the range of the previous day's candlestick. Because of above, preferred strategy on EOD charts is to do nothing and let markets give some clear direction. As of now, I expect markets to be directionless between 7800 and 8200. Current trend is down and will revert to buy on close above 8000 spot. Note strong resistance at 8200 levels. Option writing points to support at 7800 (OCT series). BNF closes at new high... first buy signal was few days ago on 5 day swing charts and today would be a buy signal on 20 day swing charts. Note that signal reliability is likely to be low as this index has been rangebound for last few months. Today was the second day of "higher high higher low" formation. Within a downtrend, upto 2-3 "UP" days are considered normal. Advance decline was marginally positive. 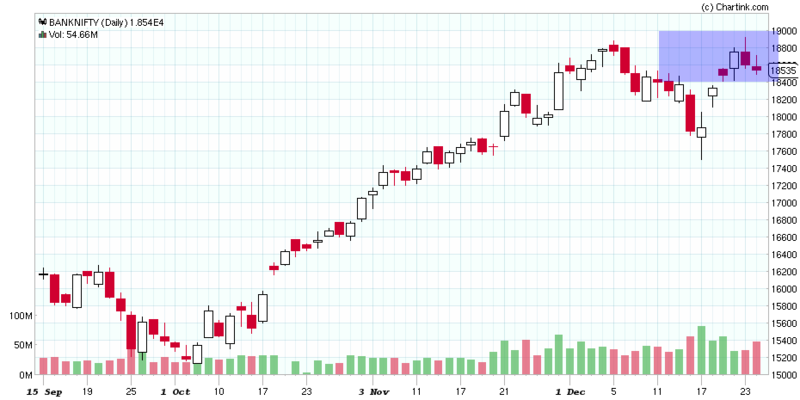 Today was the first "higher high higher low" formation. Within a downtrend, upto 2-3 "up" days are considered normal. Option writing is not giving any clues as we are heading into expiry week. NOV series clues point to support at 7500 (this is preliminary, basic and based on insufficient data). BANK NIFTY... trend is down and will revert to buy above 16300. 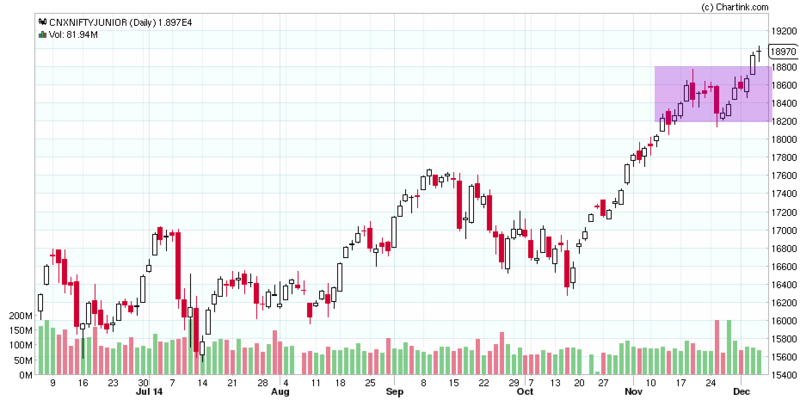 For those using 5 day swing, the index has already given a buy with SL at 15100. US markets have broken 2 swing lows and have witnessed strong selloff for 4-5 continuous days. In the overall context, we are looking at a dead cat bounce from oversold levels. 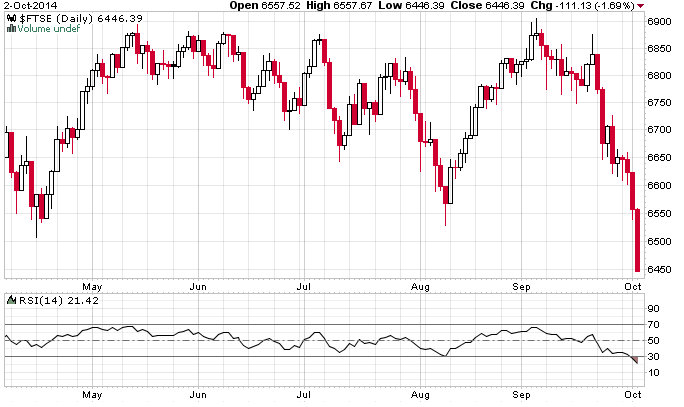 The FTSE is staging a dead cat bounce from oversold levels both on daily and weekly charts. Expect strong resistance at 6500 levels. Current trend is down and will reverse to buy on close above 8000 (more strength above 8200). Option writing points to resistance at 8000. I was expecting 7800 to hold this series but this did not happen and markets broke this quite strongly. Now option writing points to resistance at 8000. For all the weakness in global markets, our markets have still been holding above 7800 and have barely corrected 100 points this month. Option writers are winning so far and there is no change in open position status. Since markets are refusing to go down, the chances increase that they will go up. Let's see how this happens. Close above 8000 spot AND near day's high will be the first confirmation. Current trend is down and will reverse to buy on close above 8050 (more strength above 8200). Expect support at 7800 and resistance at 8050 on daily charts. Option writing points to support at 7800 and resistance at 8200 this series. Expect strong support at 7800 and resistance at 8050 on daily charts. I expect this level (7800) to be retested again before any meaningful rally happens. I am a little confused here. On the one hand you have indicated that we may be looking at a long correction phase and on the other hand you have given buy calls. Now, from my experience when markets correct, at some point or the other, ALL stocks fall, irrespective of their strengths. The strong ones will maybe fall less but they WILL fall. So why the buy calls? Can you please elaborate your thought process here. It would be very helpful in taking a decision. Expect strong support at 7800 and resistance at 8050 on daily charts. Interestingly, highest OI has now shifted to 8100 call while there has been a cut in 7800 put OI. This can have bearish implications. 5 min and hourly charts have different views. Trend is down and will reverse on close above 8200. Minor swing level is at 8040 spot. BRENT is trending down strongly ever since it broke support at 105. A technical pullback is in order considering the oversold status. The UK index FTSE was trading at 6 month high early SEP and now has lost all gains and is trading at 6 month low. 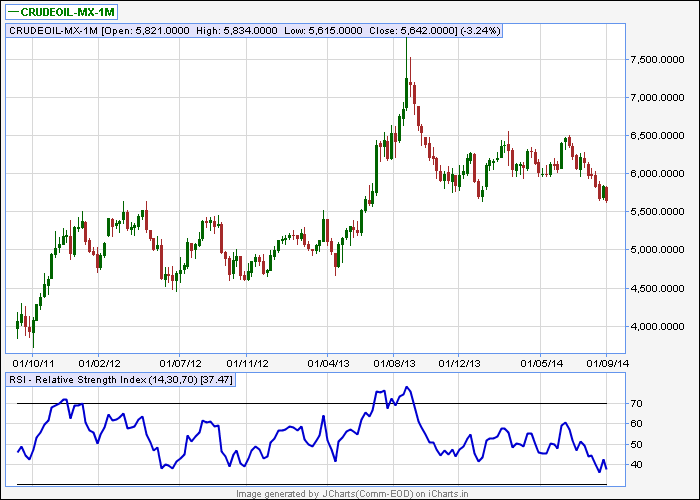 Index is oversold on RSI charts so a pullback rally is in order. This is a short week! Markets will be closed for 5 days and will now reopen on Tuesday. Not aware of any other country where this happens. With so much interlinking of markets, it is high time the powers-that-be provide a trading session on an alternate day like Saturday. 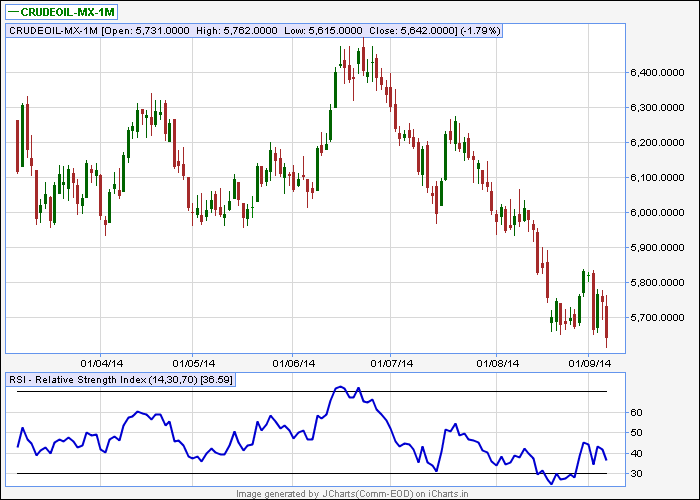 On EOD charts, trend remains down with reversal level at 8200. Support exists at 7800. Both these levels also have highest open interest for options. 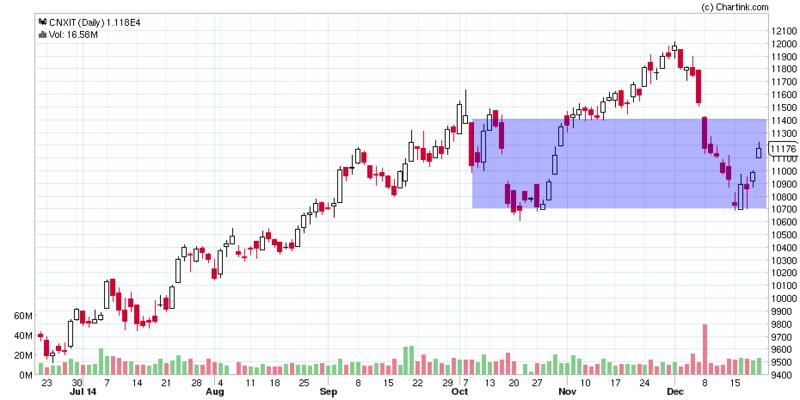 NIFTY has formed a doji (open equal to close) - this indicates a tussle between bulls and bears. It can also mean indecision with neither party willing to take aggressive trades. Some signs of buying today which got fizzled out soon. So the impact of Friday's apparently "good news" of S&P upgrading India's outlook did not impress the market. So much for fundamentals. And when markets sell off on good news or ignore them, it means something else is happening. Trend is down... more downsides below 4800. Friday's bullish piercing bar failed to generate any follow through buying thus negating any bullishness the one day rally created. This means the previous trend i.e. down is likely to continue. 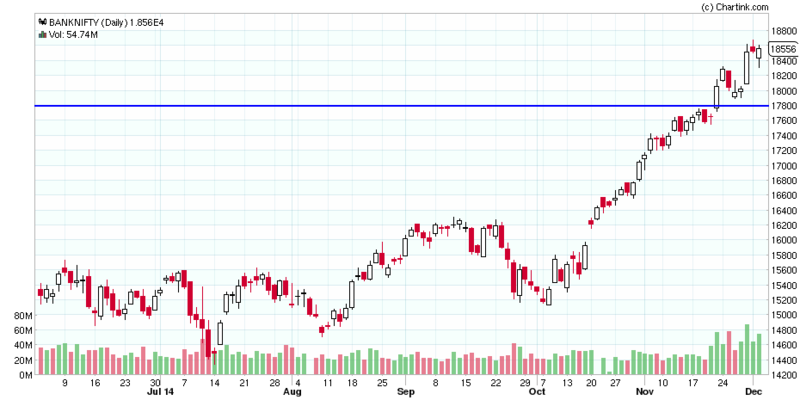 On EOD charts, we had a bullish piercing bar - this has bullish implications as long as today's low 7840 does not break. Further confirmation will come if we have a gapup opening on Monday (i.e. above 8020 spot). Inability to sustain at higher levels can mean weakness and negation of any bullishness attributed to the piercing bar. The broader trend as per swing theory is down... this will get negated if markets close above 8200 spot. Option writing points to support at 7800 and resistance at 8200. BNF also broke the swing low formed at 15775 thus indicating a change of trend. NIFTY broke key supports for the first time in this rally. The positional buy has turned to a sell the first time in 13 months. Charts are very interesting and today I will be presenting different perspectives. Trend is up and will get "stopped out" on close below 7920 spot. However expect support near 7850 spot. 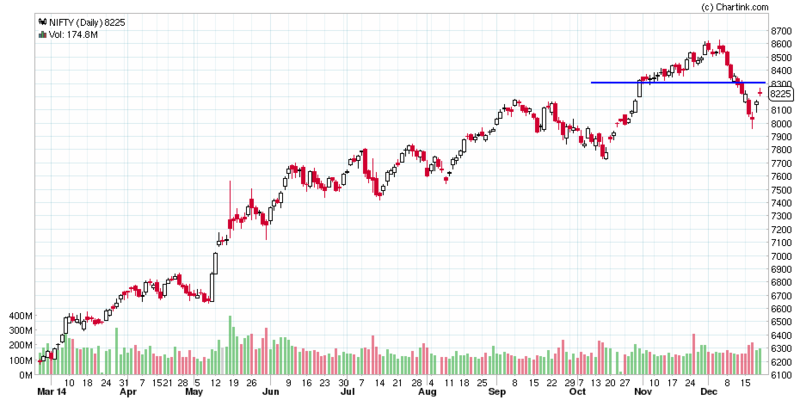 If we get an exit signal, this will be the first sell signal after 1800 points rally in nifty. 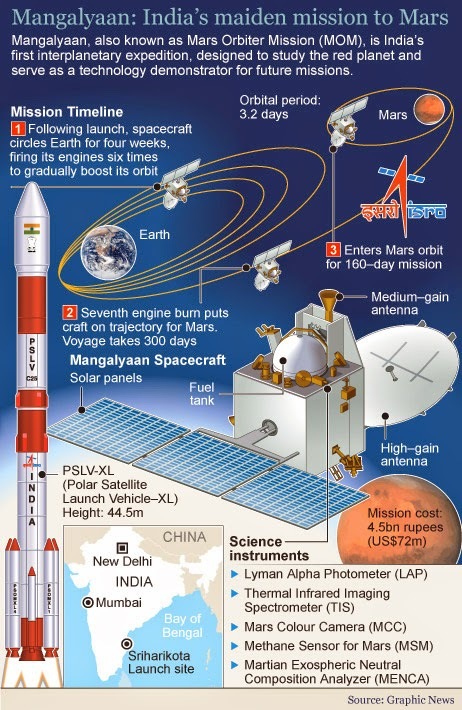 Yipee..... this is fantastic news and pardon this post in a stock market site but I am crazy about space related stuff and hence could not resist this. 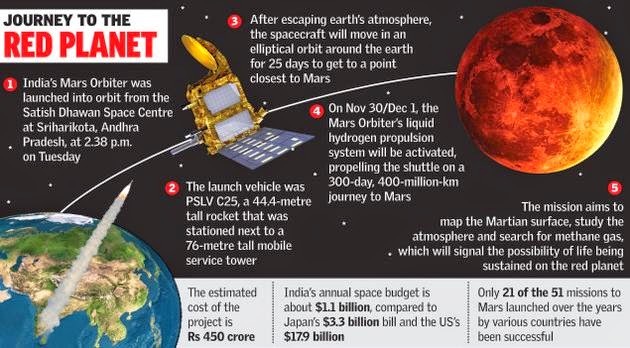 This is nothing short of a historic and a phenomenal achievement if you consider the time frame (less than 2 years from start to finish), the cost ( 450 cr a mere 10% of what others spend) and the result (first country to achieve this on maiden attempt). 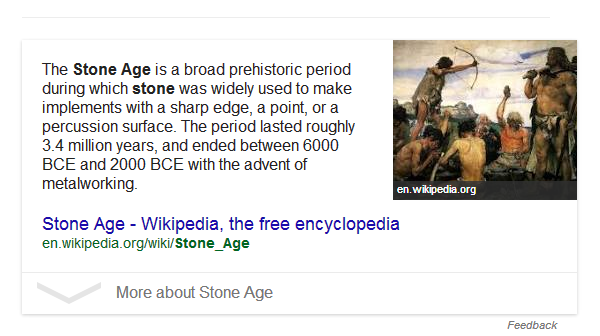 Full detailed and exhaustive information available on this wikipedia link. 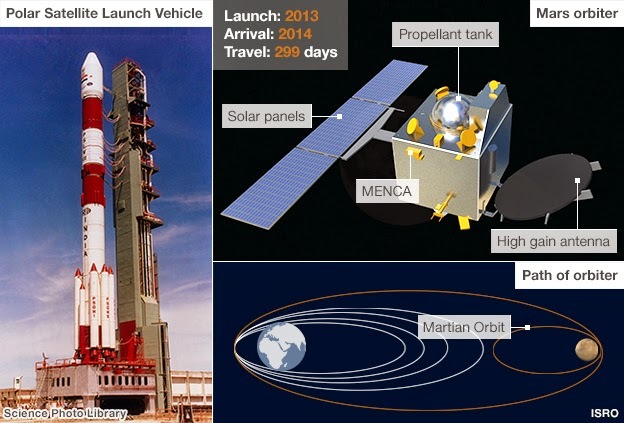 Special congratulations to the ISRO team who all made this possible. Trend is up but is showing signs of exhaustion. The frequency of down days is increasing and number of up days is decreasing. Good support exits at the region of 7850-7900. 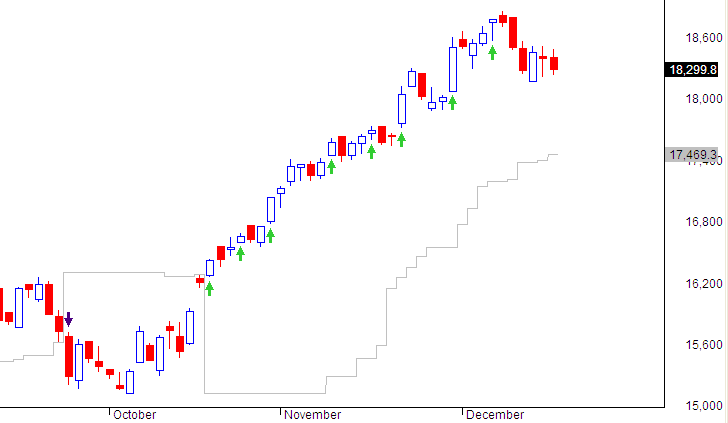 Close below this will mean trend reversal (nifty). This will also lead to formation of lower swing high and break of recent swing low (7925). 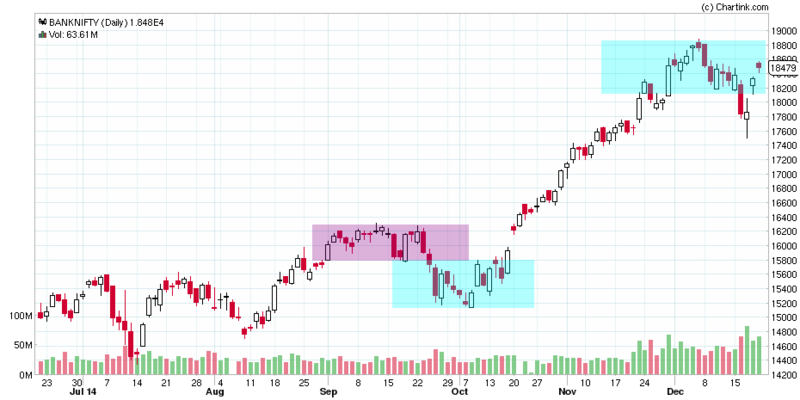 However there is a complication from the option writing clues which shows highest support at 8000 levels (OCT series). As of now option writers are bullish in the sense they do not expect 8000 to break in OCT series. This situation will change going forward though. Trend is up with support at 7850 spot. Advance decline was marginally bullish. Close above 8200 will lead to more bullishness. Just chanced upon http://www.peakprosperity.com/ when I was searching for something else. 2.Series of short simple and easy to understand videos on managing the coming crash. 3.Refreshing new way of analysing current global economy. 3.The author. Chris Martenson has an interesting bio which nicely explains his motivation to get into teaching, then financial management and his transition to an eco guru or scientist. Bio makes pleasant and worthwhile reading. NIFTY closes near high of this week. All time high is 8180 spot. Going forward, the region of 7850-7900 is going to be an important level for trend reversals. VIX is at record low levels and is creating fear in me just when others are getting greedy. Trend is up with reversal level at 7540 spot... my tentative higher SL is now at 7850 spot. VIX is at extremely low levels and I am getting worried now. Trend is up with support at 7540 spot. On my swing indicator, trend reversal will be confirmed on close below 7850 spot. NOTE: this sell signal can sometimes lead to a whipsaw as profits to date are high at 1700+ points and after a strong trend it is normal for markets to trade sideways and thus generate false signals. Trend is up with swing low support at 7540 spot. While correction has started, a faster retracement of the rally starting 7540 will confirm end of this bigger rally starting from 5500 levels. Open writing points to resistance at 8200. VIX was marginally up indicating not much panic in option writers. No matter how much analysis you do, the probability of any trade failing or succeeding (over a 1000+ trades) is on an average 50%. Position sizing will take care of the risk. Once you understand this, it does not matter what system you follow or how much analysis you do. I understand from your blog that risk per trade should be limited to 1% of capital. So if I have Rs.500000 to invest, my risk per trade would be Rs.5000. 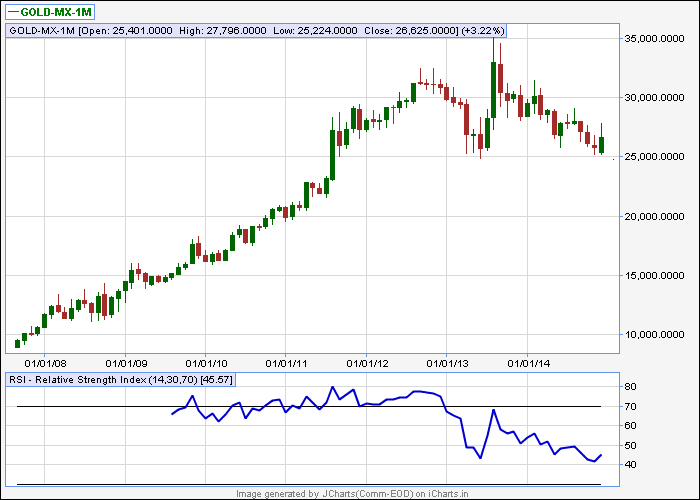 Suppose the Last close of a stock is Rs 100 and SL is at 90 (10%), the no. of shares I should limit to is 5000 / (100-90) which is 500 valued at Rs. 50000. What is your advice regarding limiting investment per stock to certain %age of total of capital, say 2%, 3%....so on, or should it be decided by number of max positions one should keep. Suppose, I am not comfortable with more than 20 open positions at a time. This will limit my investment to 500000/20 i.e. Rs.25000 investment per stock. What are your views on limit of investment per stock, if one is keeping aside Rs. 5 lac capital for shares. And what will be investment limit per stock if the capital is Rs. 10 Lac. Trend is up with support at 8000 and then 7540. Option writing points to support at 8000 and resistance at 8300. Overall bias is bullish. Trend is up with support at 10600. 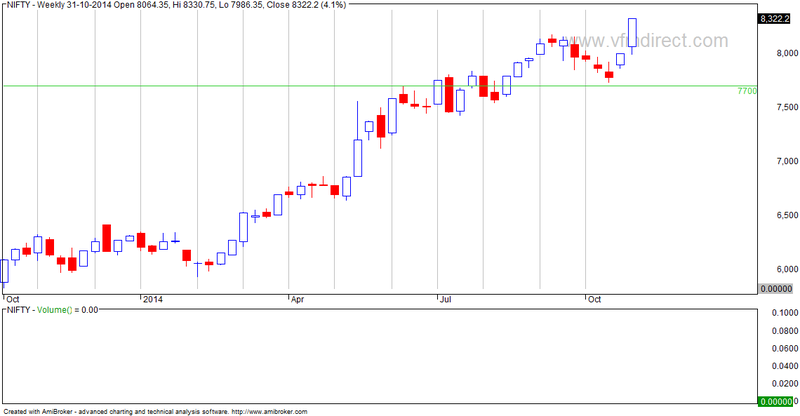 On weekly charts, trend is again up ( 3 year charts) and we have minor support at 9500 and swing low support at 8500. 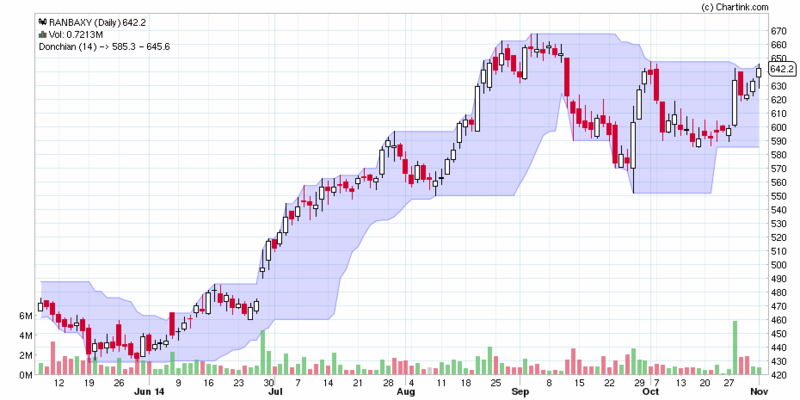 BNF is bullish with support at 15600... last few candlesticks indicate sustained buying at lower levels. Trend is up with support at 8000-7840 spot. Though markets opened gap down, selloff was limited and advance decline was actually positive. This is a bullish sign. Trend is up and will reverse on close below 7540. Strong support exists at 8000. Trend is up with support at 8000-7840. Deep swing low is 7540 spot. Option writing points to increasing support at 8000 levels. Decreasing VIX is a cause of concern as complacency has usually led to trend reversals. Trend is clearly down and with reversal possible on close above 6000. Immediate SL is 5850. 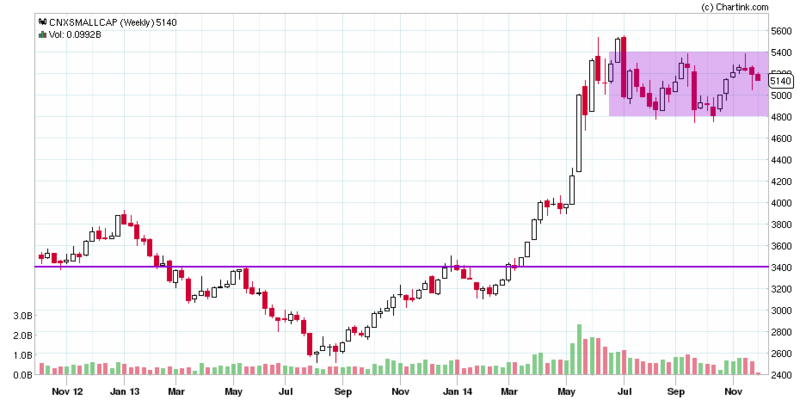 On weekly charts, expect strong support at 5500. But if this breaks and crude is unable to recover, expect next support 20% down at 4500.